Hi, I am interested in your 1956 Buick Special (stock #1233-NSH) listed on Autotrader for $18,995. I'd like to get more information about this vehicle and confirm its availability. 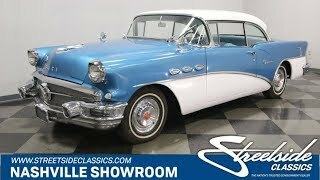 This is an honest, old school, Buick Special with several unique features that carried on to other Buicks and became signature characteristics, as well as one that didnt, but that makes you wonder why not. It is very original and stock with little freshening up done on the vinyl upholstery for your comfort. Check it out. The Special had become Buicks best-selling car by the mid-50s. They became known as a Bankers car because the level of style and luxury they offered at a tremendous value. For one thing, they were adorned with lots of chrome and it all has a survivor patina to it on this car. The hood is topped by a fighter plane like ornament and the grill has a gun-sight in the center with a bold chrome edge above it and twin bar bumper under it that wraps around the side to the front fenders. Those fenders have three ventiports that are meant to simulate the exhaust ports of a fighter plane and underneath them is a sweepspear character line that divides the Dover White and Electric Blue two-tone paint running back and down to the rocker, then up and over the rear wheel well. The back of the car has its share of chrome too dressing out the vertical taillights that run from the top of the fenders to meet the bumper at the bottom. Open the door and you will find an interior that is wonderfully original with a survivor look to the dash and controls while getting freshened up with new carpets and vinyl. The door panel sets the pattern in a nice two-tone Blue topped with a bold cap of chrome along with a slash of chrome across the middle that echoes the curve of the line on the body. A comfortable armrest has power window switches and door lock button at your fingertips. The split bench seat is comfortable and looks great recovered in Dark and Light Blue with a pleated accent sewn into the top center. The big round steering wheel has a full round horn button with a crest of arms in the center announcing that it has power steering. The dash has more survivor chrome with a rectangular speedometer and gauges and vertical bars surrounding the radio and with the ventilation controls at the bottom. Fresh carpeting ties the look together nicely and makes for a comfortable car to cruise in. Open the hood and you will find a V8 engine of 322 cubic inches which has a unique feature to it that didnt catch on for some reason. The valve covers were attached vertically in contrast to the angled attachment of other V8 engines to enable the motor to fit into smaller spaces while maintaining easy access for maintenance. Anyone who has tried to change spark plugs on a V8 engine in almost any car will understand the advantage of this design and wonder why it was abandoned. The engine is stock with a black oil bath air cleaner feeding a 4-barrel carburetor. Signs of good regular maintenance include a newer brake booster and master cylinder, new plugs cap and wires, as well as a newer alternator and battery. Power flows back through a three-speed automatic transmission to the rear wheels that are mounted on coil springs, not leaf springs as was the norm back then, because this is a Buick, and coils give a better ride. The car rides on 205/75R15 white wall tires with Buick hub caps that look great. Come on down and check out this wonderfully original example of luxury from the mid-50s with a refreshed interior that makes for comfortable cruising.